Speaking with reporters as they cleaned out their lockers today, a pair of Jets defensemen commented on their future with the team. Pending UFA Tyler Myers indicated (via Murat Ates of The Athletic) that he’s open to starting discussions with GM Kevin Cheveldayoff as soon as the team is ready to do so. Myers took a small step back statistically this season but remains one of the top blueliners that will potentially be available on the open market. Meanwhile, pending RFA Jacob Trouba was largely non-committal about his future, relays Sportsnet’s Rory Boylen. He’d only acknowledge that they’d talk in the summer which suggests there are no imminent discussions on the horizon. Trouba’s willingness to sign long-term with the Jets has long been in question but he has certainly bolstered his negotiating leverage as he had a career year in 2018-19 with 50 points in 82 games. If he so desires, he can sign a one-year deal this summer and become eligible for unrestricted free agency in 2020. Blackhawks prospect Evan Barrett has decided to remain at Penn State for his junior year, reports Scott Powers of The Athletic (subscription required). The center, a 2017 third-round pick, had a strong sophomore season with 43 points in 32 games and gave serious consideration to turning pro. He recently underwent surgery for an undisclosed injury and will miss two-to-three months. Meanwhile, from the same report, Powers notes that goalie prospect Ivan Nalimov is unlikely to sign with the Blackhawks. His KHL contract with Avangard Omsk is set to come to an end next week but with several others already ahead of him on the depth chart, he could be looking at spending time in the ECHL next season. If another team has interest in him, he could be a trade candidate but the odds of that will decrease if he signs an extension in Russia. Flames GM Brad Treliving told reporters, including Sportsnet 960’s Pat Steinberg, that center Sean Monahan was playing through a cracked thumb. Monahan averaged over a point per game during the regular season but was held to just a goal and an assist in five postseason contests. He added that goalie David Rittich had been playing through a knee injury late in the year which may at least partly explain why he wasn’t given a chance to play at some point during their series loss to Colorado. I think they’re looking for a guy to have there as insurance. I believe that David Rittich—it’s Calgary’s plan to make David Rittich their long-term guy. I think everything they’re doing this year is trying to show David Rittich that they believe in him and that he’s their long-term guy. So I’d be surprised if they go out there [at the trade deadline] and got a number one guy. I think they’re going out there to give [Rittich] some help, and if they need it down the stretch. I think long-term, [Rittich] is your number one goalie. I think that’s Calgary’s plan because they know him, and I think that’s what they want to do. Rittich, 26, has certainly shown himself to be a capable netminder this season. In 33 appearances he has a 20-4-5 record and .915 save percentage, and has been a huge reason for the team’s success in the Pacific Division. The Flames enjoy a one-point lead over the San Jose Sharks, but are eight points clear of the third place Vegas Golden Knights. Rittich has also represented an incredible bargain for the team, signed to a one-year $800K contract. That’s his third contract since originally signing as an undrafted free agent with the Flames in 2016, meaning this is also the only NHL organization he’s ever known. It will be interesting to see if the Flames decide to offer Rittich a long-term contract before he hits RFA status, given that he has arbitration rights this summer as well. Just a year away from unrestricted free agency, the goaltender could potentially hold out for just the one-year arbitration award and walk next summer as a 27-year old potential starter. Calgary will likely want to avoid that outcome, making an extension a real possibility over the next few months. Perhaps more importantly than his play in the first half though is how he fares for the team in the playoffs. The Flames have been burned poor postseason performances in recent years, including Brian Elliott’s implosion in the first round against the Anaheim Ducks in 2017. After a relatively successful season, Elliott posted an .880 save percentage through four games as the Flames were swept out of the playoffs with ease. Without any NHL playoff experience, handing the reins to Rittich will be a difficult decision. With the trade deadline fast approaching, we will be taking a closer look at the situation for each team over the coming weeks. Where do they stand, what do they need to do, and what assets do they have to fill those needs? As we begin to examine the Pacific Division, here is a look at the Calgary Flames. The Calgary Flames are the kings of the Western Conference so far. With 71 points in 51 games, the Flames hold a commanding six-point lead with a game in hand over the San Jose Sharks in the division and are three points up on the Winnipeg Jets overall. In fact, the Flames trail only the Tampa Bay Lightning in the NHL standings right now. The team has been rolling on all cylinders this season, finding success on both offense – No. 2 in goals per game – and defense – No. 7 in goals against per game. However, Calgary is not without fault and will be looking to add in several areas at the deadline. However, GM Brad Treliving and company must be methodical in their approach. The Flames have just over $7MM in cap space to work with and need to be sure of their priorities when it comes to the market. The team also needs to avoid trading one of their most valuable trade assets, this year’s first-round pick. With only five selections scheduled for this June, losing their first-rounder could see Calgary make their draft debut in the late third round. As such, the Flames need to do what they can to capitalize on the strong regular season and improve before the postseason, but will be forced to be more strategic than a typical all-out buyer. If the Flames indeed take this year’s first-round pick off the table, it will have repercussions in their dealings with sellers. Depending on the team and target, some may be happy with next year’s first-rounder or, in a buyer’s market, a later pick. Others could look for a pro-ready piece to substitute the immediate boost of a first-round talent in the system. If that’s the case, Calgary has to be prepared to listen to offers including Sam Bennett. Bennett, the 2014 fourth overall pick, is struggling through another disappointing season. Now in his fourth year with the Flames, Bennett has yet to crack 20 goals or 40 points in a single season and looks likely to fall short yet again. It is far from the output that Calgary expected, but they have stuck with the frustrating forward thus far. Bennett’s ability is apparent and he’s shown flashes of brilliance from time to time, but he has been unable to put together a complete game. Even as the 22-year-old has tried to embrace a more physical, high-energy style over the past season plus, he has again missed his mark and has become a penalty liability far too frequently, especially for a team with a poor penalty kill. Bennett may reach his potential one day, but it seems unlikely to be with Calgary. In a season where the Flames have a legitimate chance to win the Stanley Cup, they need to finally give up on Bennett if that’s the price of a much-needed addition. Another castoff who has yet to meet expectations is Curtis Lazar, who could still have some intrigue for sellers. One of the Flames’ current young defenseman could also be a trade deadline target. With five capable veterans on the back end signed through at least next season and three promising young defenders itching for more NHL responsibility, someone is going to be the odd man out next year. Juuso Valimaki, the team’s top defensive prospect, seems like a safe bet to stay put. However, the current bottom pair of Rasmus Andersson and Oliver Kylington may not stay together much longer. Both have more than proven themselves as capable pros this season, but if the Flames want to land a big fish at the deadline, they may have to give up one or the other. Losing Kylington would hurt slightly less than Andersson. Among other prospects, first-year pro forwards Matthew Phillips and Glenn Gawdin are sure to draw interest, but the Flames may be hesitant to move either. However, with Dillon Dube out of the question, the pair could be next up among Calgary’s top minor league pieces. The Flames could try to capitalize on the breakout season of USHL star Martin Pospisil to sell high on the recent fourth-rounder. 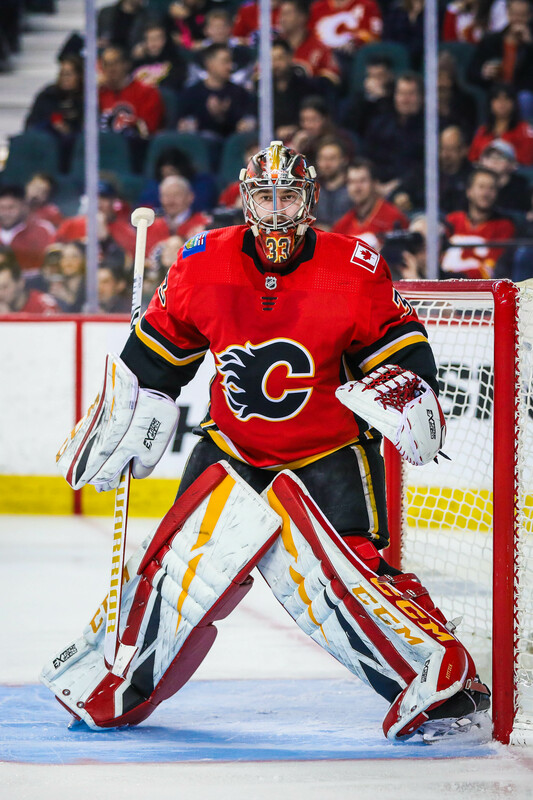 Finally, with Jon Gillies officially losing out to David Rittich in the battle of young goaltenders in Calgary, the Flames would likely be open to moving the struggling 25-year-old. Especially if they are in pursuit of a replacement goalie of their own, the seller may like the idea of taking a waiver on another young goalie and Gillies fits the bill. So too may Tyler Parsons. 1) Starting Goaltender: Most contenders don’t get to that point if they have a need at starting goaltender. This year’s Flames are a rare exception. Incumbent starter Mike Smith has struggled all year long and has a sub-.900 save percentage and a goals against average up over 3.00 in 25 appearances. Young David Rittich has take over as the go-to option and has performed admirably in 30 appearances, but has faded since his hot start to the season. Most likely, Calgary’s Cup hopes live and die by what they do in net. Doing nothing at all will likely cost them their chance barring a heroic return to form from Smith. Adding a third goalie to at least compete for starts will let them continue their current trajectory. Carolina Hurricanes’ keepers Petr Mrazek or Curtis McElhinney could fall into this group, as could Cam Talbot from the rival Edmonton Oilers or old friend Brian Elliott, if healthy. If the Flames instead opt to upgrade the position with one of the three main goalies on the market – Sergei Bobrovksy, Jimmy Howard, and Semyon Varlamov – one would have to think that their title chances would improve significantly. The trick will be adding one of these three at a reasonable price while also keeping enough cap space open to add in other areas. Moving Smith in another deal could be an option. 2) Top-Nine Winger: Michael Frolik, Sam Bennett, James Neal, and Austin Czarnik simply haven’t panned out as expected this season. As dominant as the Flames’ top line and two-thirds of their second line has been, they have needed help on the wing in the middle six for much of the year. If they can add a forward that can also help out their 21st-ranked penalty kill, that would be even better. If they can add two such capable two-way wingers? That would be ideal. Again, the Flames lack of cap space and bigger need in net make this a likely result, but Calgary has a serious need for depth on the wing and it could be exposed in the postseason if not addressed. Some of the more cap-friendly outside options are likely to be targets, such as Jakob Silfverberg, Richard Panik, Ryan Dzingel, or Patrick Maroon. However, the possibility of a return to Calgary for Micheal Ferland remains one of the most intriguing possibilities at the deadline. Ferland seemingly would be a great fix for what ails the Flames. 3) Veteran Depth Defenseman: Even though depth on defense has been identified as a strength for the Flames moving forward, there are some concerns at present. Michael Stone is currently sidelined with a blood clot issue and there is no definitive timeline for his return. Meanwhile, rookies Rasmus Andersson, Oliver Kylington, and Juuso Valimaki have played a little over 100 career NHL games combined and the other young options in the AHL aren’t instilling any confidence. Calgary has an impressive top four that they will no doubt lean on in the playoffs, but just one injury could leave Dalton Prout as the team’s top replacement option and that is a problem. The Flames need to add another experienced veteran to the blue line and, even if the right-handed Stone returns to health, could use an extra body on the left side preferably. Treliving would have to get creative, but Detroit’s Niklas Kronwall would be a great fit. More affordable options include Jordie Benn and Brandon Davidson among others. Despite many eyes across North America focused on the NFL Wild Card playoffs, the NHL has a busy Sunday scheduled this weekend. Seven games are on tap today, with the Carolina Hurricanes and Ottawa Senators—two teams that are in the rumor mill—kicking things off this afternoon. As always, we’ll keep track of all the minor moves around the league today. The Toronto Maple Leafs have sent goaltender Kasimir Kaskisuo back to the minor leagues once again, and could have him dressed for the Toronto Marlies game this afternoon. Kaskisuo has been serving as the backup for Michael Hutchinson while the team deals with injury, but still hasn’t gotten into an NHL game. With Frederik Andersen expected to return soon, he may have to wait for another opportunity. Though the terminology varies on the ECHL and AHL websites, minor league defenseman Nolan De Jong will be playing for the San Jose Barracuda for the time being. With Jacob Middleton recalled by the Sharks, the Barracuda have acquired De Jong to give them some more depth on the back end. The former University of Michigan captain has nine points in 22 games with the Utah Grizzlies of the ECHL this season. The New Jersey Devils announced they have recalled goaltender Cam Johnson from the Binghamton Devils of the AHL. He was recalled with the recent injury to MacKenzie Blackwood, who is day-to-day with a lower-body injury. Johnson will serve as the backup today against Vegas. The former University of North Dakota standout has had an up and down season between the ECHL and Binghamton. While he has had quite a bit of success with the Adirondack Thunder, he hasn’t been as successful in 14 AHL games. Johnson has a 3.91 GAA and a .866 save percentage. To make room for Johnson, the team assigned defenseman defenseman Egor Yakovlev to the AHL. The Calgary Flames announced they have assigned forward Dillon Dube and goaltender Jon Gillies to the Stockton Heat of the AHL. Dube has appeared in 23 games with Flames, but if the team is sending him down, it’s likley that forward Andrew Mangiapane is ready to return from injured reserve. And with David Rittich healthy and ready to go, the team didn’t need Gillies, who was serving as an emergency backup. He has yet to make an appearance for Calgary. The Anaheim Ducks have assigned both forward Ben Street and defenseman Jake Dotchin to the San Diego Gulls of the AHL, according to Eric Stephens of The Athletic. Both players had cleared waivers recently. The team also sent defenseman Korbinian Holzer to San Diego. The moves are expected to open up roster spots for the return of center Rickard Rakell and Cam Fowler, who have been on injured reserve. Rackell has been out since Dec. 5 with a ankle injury, while Fowler has been out since Nov. 12 with a facial fracture. UPDATE: Stephens adds that Fowler has officially been activated off of injured reserve. The Edmonton Oilers will get back a key defenseman as they announced they have activated Kris Russell, while placing forward Kailer Yamamoto on injured reserve. Russell has been out since Dec. 11 with a groin injury and has been badly missed in Edmonton, who have since acquired multiple defenseman to add depth to their team. Russell has eight points and a plus-four rating for the Oilers. Yamamoto, the team’s first-round pick in 2017, is still trying to gain a full-time position with the team, but has just a goal and two points in 13 appearances, while having eight points in 11 games in the AHL. The Pittsburgh Penguins announced they have recalled Chad Ruhwedel from his conditioning stint with the Wilkes-Barre/Scranton Penguins. The 28-year-old defenseman has played the role of the team’s seventh defenseman for several years now, but found himself in the press box for a long stretch of time, since Nov. 19, and the team opted to send him to the AHL to get him back into game shape. Ruhwedel played five games for Wilkes-Barre/Scranton, posting one goal, five points and a plus-eight. While the Avalanche have been led by a dominant trio in the first half of the season, they need to add some secondary scoring if they want to take a step forward before the playoffs, argues Jared Clinton of The Hockey News. Colorado has some promising young prospects on the horizon that they shouldn’t be dealing from but with some injuries between the pipes starting to occur, this could be an opportunity to deal Semyon Varlamov for some scoring help. Defenseman Nikita Zadorov has also been available at varying times over the last couple of years and could yield a forward in return. The Avs went into play tonight with just a two-point cushion on the last playoff spot so getting some scoring help may be something they want to do before next month’s trade deadline. The Flames are expected to have goaltender David Rittich back between the pipes on Saturday, notes Postmedia’s Wes Gilbertson. He has missed the last two games due to a lower-body injury. The 26-year-old has been a key player for them in the first half of the year as he has taken away some starts from veteran Mike Smith and has posted stellar numbers with a .920 SV% along with a 2.39 GAA. Blackhawks goaltender Corey Crawford is not making progress from the concussion he sustained last month, head coach Jeremy Colliton told Madeline Kenney of the Chicago Sun-Times. That’s certainly not an encouraging sign for a player whose recent concussion history is quite significant. Chicago will stick with rookie Collin Delia and veteran Cam Ward for the time being although this may cause them to delay any potential plans of looking to move Ward (provided the pending UFA waives his NMC) until closer to the trade deadline. Jets winger Nikolaj Ehlers suffered an upper-body injury in Friday’s game against Pittsburgh, the team announced. The injury occurred in the first period and while he tried to come back for a shift, it didn’t go over well. The 22-year-old is quietly on pace for his first career 30-goal campaign and if he’s out for any significant period of time, that would be a big blow to Winnipeg’s attack. While some fans may very well still be nursing hangovers from their New Year celebrations, the league is back in action with six games scheduled for the second day of 2019. The Colorado Avalanche will try to break their losing streak, while the Edmonton Oilers are just trying to find a way to stay afloat in the Pacific Division. Both teams will take on Western Conference opponents later this evening, and we’ll be here keeping track of moves made by those or any other team today. The Toronto Maple Leafs have recalled Trevor Moore from the minor leagues under emergency conditions as the team prepares for their game tomorrow night. Moore is currently filling in for injured forwards Zach Hyman and Tyler Ennis, though the former has resumed skating on his own and should be back before long. The Calgary Flames have recalled goaltender Jon Gillies, after David Rittich allowed five goals on 33 shots Monday against the San Jose Sharks. The Flames are back in action today against the Detroit Red Wings, and Rittich is apparently dealing with a lower-body injury. Brian Lashoff is back in the NHL with the Red Wings once again, a transaction that has an air of deja vu given how many times the veteran defenseman has bounced up and down this season. Lashoff has yet to actually play in a game for Detroit this year, but has been involved in six transactions since clearing waivers earlier on. The Montreal Canadiens have sent Michael McNiven back to the minor leagues, indicating that Carey Price is at least healthy enough to serve as backup tomorrow. That is a huge step in the right direction for the Canadiens as they try to continue to compete for a wildcard spot in the Eastern Conference. While asking the question of when will Vancouver Canucks prospect Olli Juolevi play his first NHL game, Ben Kuzma of The Province writes that his chances of making this year’s squad has already been hampered when he suffered a lower-back injury during offseason training. The 20-year–old fifth-overall pick in 2016 had a minimally invasive disk procedure to relieve pressure on his spinal nerve column, which was expected to sideline him for eight to 10 weeks. Kuzma writes that defenseman Alexander Edler suffered a similar injury back in the 2010-11 season and needed a full 10 weeks to recover. Juolevi likely won’t begin full-intensive training until the end of August, therefore, and will only get about three weeks to get in shape for training camp. With his chances of making the team already a question mark before 2018 first-rounder Quinn Hughes announced he would return to the University of Michigan, what are his chances now? Eric Stephens of The Athletic (subscription required) writes that with the signing of Ondrej Kase to three-year, $7.8MM deal, the Anaheim Ducks may have quite the logjam at the forward position this year as the team likely will have to find a more prominent role for Kase, which could be challenging. The team has a logjam at the right wing position as many believe that veteran Patrick Eaves could likely join Ryan Getzlaf on the team’s top line next year. The second line will be either manned by Jakob Silfverberg or Corey Perry, which could force Kase to move to the fourth line. That’s not likely to happen. So what can they do for Kase? Move him to the left side? Stephens writes that might work for temporary situations such as injuries that come up, but is hardly a permanent solution for the 22-year-old who is just starting to enter his prime. Stephens adds that a more likely possibility, especially if Ryan Kesler is not ready for the regular season, would be to move Silfverberg off the right side to accommodate Kase. Kent Wilson of The Athletic (subscription required) writes that the Calgary Flames may have redesigned their team, but they are taking a big gamble in the net with 36-year-old Mike Smith. The veteran had an amazing first-half of the season before suffering an injury and never looked the same. While the hope is that Smith is fully recovered and should return to form for this season, Wilson writes that he’s entering the “danger age” for goaltenders who have historically fallen off a cliff at 36. If the team can’t get a big year from Smith, the team only has David Rittich and Jon Gillies as insurance, which could crush the team’s hopes for a playoff berth in a very deep Pacific Division. Jamie Umbach of NHL.com takes a look at the Edmonton Oilers defenseman Oscar Klefbom, who regressed last season after a breakout season in the 2016-17 season in which he tallied 12 goals and 38 points. However, a shoulder injury sustained in the Western Conference Finals hovered over him all of last year to the point that he five goals and 21 points in 66 games before he opted to have season-ending surgery to repair his shoulder. Klefbom has been given a clean bill of health this offseason is ready to return for a big season next year. “It feels good going home knowing the shoulder is 100 percent so I don’t have to go through this again with medications and injections,” Klefbom said. After the Calgary Flames traded defenseman Dougie Hamilton to Carolina for Elias Lindholm and Noah Hanifin, don’t be surprised if Calgary fans compare Hamilton and Hanifin for years to come. That could put a lot of pressure on the 21-year-old Hanifin as the restricted free agent will try to acclimate himself to the Flames this season, according to NBC Sports’ James O’Brien. Regardless, it’s far too early to compare the two players. While Hanifin had a breakout season last year, he still has the potential to take his game up another level. While his numbers inched a bit last year from 29 points to 32, a deeper look into his numbers suggests that he’s become more comfortable on offense as he more than doubled his goal total from the year before with 10 goals last year. However, much of the comparisons could come down to whatever salary that Hanifin walks away with after he signs. If he signs a deal for $3MM per year, then everyone will look at the swap for Hamilton, who makes $5.75MM, as a better deal. However, if Hanifin walks away with an even bigger deal that might compare to Hamilton’s deal, then expectations for the blueliner will only increase. Flames beat writer Ryan Pike suggests the team could have some cap trouble with its long-term plans, especially at the goaltending position. The team will have 13 players under contract in 2019-20 that make $5MM or more. With 36-year-old Mike Smith likely moving on after his contract runs out next season, the team may not have much cap room left to sign a respectable goalie. The team may hope that its goaltending pipeline of David Rittich, Jon Gillies and Tyler Parsons might help them out, but could be forced to look for another veteran in a year if none of them is ready to take over as a starter. Another big question asked by NHL.com’s Aaron Vickers is what type of performance will the Flames get from Smith. The veteran started the season well for Calgary, posting a 2.39 GAA and 20 victories in the first half of the season. Unfortunately, Smith went down with a groin injury and missed 13 games in January and February and looked a shell of himself after that, putting up a 2-6 record in his final eight appearances with a 3.44 GAA. Assuming he’s fully healthy, however, the question even then remains whether Smith can hold up for another full season. In another article, Vickers looks at the team’s top prospects and suggests that top prospect Juuso Valimaki has a good chance to win a roster spot out of training camp. Valimaki, the team’s 2017 first-round pick, had a solid season with the Tri-City Americans of the WHL, but really stepped up his game in the playoffs when he tallied four goals and 17 points in 12 games. He has a tough road ahead of them, but if Calgary feels that he is better than third-pairing players like Brett Kulak and Michael Stone, Valimaki could bump either of them. Pike also adds that with the buyout of Troy Brouwer, the Calgary Flames have now removed eight players from their 2017-18 opening roster, including Brouwer, Hamilton, Matt Bartkowski, Eddie Lack, Micheal Ferland, Freddie Hamilton, Matt Stajan and Kris Versteeg. While some of those moves came mid-season, the Flames needed some roster overhaul after their disastrous second half of the season. The situation in Vancouver surrounding the sudden resignation of President Trevor Linden continues to be murky at best. Francesco Aquilini and the ownership continue to avoid prying questions, while GM Jim Benning and coach Travis Green continue to be on the hot seat instead. Many would like to know what led to the departure of a young executive with deep loyalties to the organization, but answers have been few and far in between. Mike Johnson of Sportsnet talked to Benning and Green, but found out little. Benning spoke highly of Linden, but said “I don’t know all the reasons why (he resigned) and it’s not my place to comment on it.” Johnson suggests, as many have, that Linden’s departure may not have been as independent as it appears and that he may have been forced out due to conflicts with the ownership. For his part, Benning says that he never noticed any discourse and says that nothing has changed about the team’s vision and direction. Green added that he thought the best of Linden, but that his departure won’t change the organizations game plan. However, that could change and so could the dynamic of the team’s front office. Sportsnet’s Iain MacIntyre reports that Benning has been told that the Canucks are not searching for a replacement for Linden, implying that Benning would absorb some of the responsibilities that he has been given already in Linden’s absence. However, that directly contradicts another report that former Los Angeles Kings GM Dean Lombardi has already been connected to the vacancy. It seems that there is still a lot to be revealed about both the past and future conditions of Vancouver’s leadership. The Athletic’s Lisa Dillman wonders if Los Angeles Kings backup goalie Jack Campbell will be the second coming of Martin Jones for the team. Campbell, who endured a bust label for years as a Dallas Stars first-round pick in 2011 who struggled to find success early on as a pro, finally looked like a legitimate NHL goaltender in five appearances with the Kings last season in his second year since being traded away by Dallas. Campbell started four games and made one relief appearance, posting a save percentage of .924 and a goal against average of 2.48 and also played well in the AHL. Dillman reports that this performance has L.A. expecting Campbell to be the primary backup to Jonathan Quick next season, despite the presence of veteran Peter Budaj and promising prospect Cal Petersen. The Kings hope that by committing to the young keeper that they could end up with another reliable asset like Jones. Jones also struggled to stick out in his early pro seasons, albeit as an undrafted free agent, before putting up stunning numbers as Quick’s backup for two seasons once he was given a real shot. The Kings have Campbell locked up for two more years – and Quick for five – so they would love to get a repeat performance of Jones, with Campbell providing elite play as the backup until the point that they can trade him away. This time they just hope that he won’t get flipped back into the division like the Boston Bruins did with Jones, who now frustrates the Kings on a regular basis as the starter for the San Jose Sharks. The Calgary Flames received the salary arbitration award for defenseman Brett Kulak on Wednesday and also agreed to terms on extensions with forward Mark Jankowski and goalie David Rittich in the past 48 hours, avoiding arbitration, yet they still aren’t done. The next scheduled arbitration hearing is none other than another Flame: forward Garnet Hathaway. Hathaway and his side are set to sit down with Calgary and an arbitrator on Monday if nothing can be agreed upon by then. With the Flames preoccupied working out three other contracts over the past two days, it would be no surprise if the two sides at least exchange briefs and filing numbers over the next day or two which could perhaps speed up negotiations. Hathaway played in only 59 games with Calgary last season and has less than 100 NHL games total to date, so it would be a surprise to see the fourth liner actually go through the arbitration process without a deal. However, most would have made a similar argument about Kulak, whose case was actually farther apart in terms of perceived value than many would have thought given his somewhat minor role. Garnet could be the same way, as their has been little talk of an agreement, and the Flames could be destined for yet another hearing. The Calgary Flames have avoided arbitration with another restricted free agent, this time signing David Rittich to a one-year $800K contract. Rittich was scheduled for an arbitration hearing on July 28th, but has settled on a one-way contract with the Flames that could potentially take him to Group VI unrestricted free agent status next summer. The 25-year old goaltender is heading into his third professional season in North America, and would need to play in at least 13 games (for 30 minutes or more) to become ineligible for Group VI status. There’s no guarantee Rittich gets that many games, as he’ll be battling Jon Gillies for the right to backup starter Mike Smith. Still, he should have an inside track in that fight given Gillies’ waiver-exempt status and two-way contract. If Rittich does get the NHL backup role, he’ll be trying to improve on the .904 save percentage he posted last season and show that he belongs in this league for the next chunk of his career. The undrafted goaltender signed with the Flames out of the Czech Republic in 2016, but hasn’t found much consistency at the NHL or AHL levels. The Flames still have three restricted free agents to sign, but are down to just Garnet Hathaway as an arbitration-eligible player. His hearing is scheduled for Monday July 30th, after which the team can focus on extending Noah Hanifin. Getting Rittich, Hathaway, Brett Kulak and Mark Jankowski out of the way has taken a good chunk of the offseason, but the team still has plenty of time to find common ground on a long-term deal with Hanifin.